In mid-April, with snow in the forecast for SE Wyoming, I was happy to turn my Jeep towards warm & sunny Las Vegas, Nevada, for the 2015 World Cup Dressage & Show Jumping Finals. 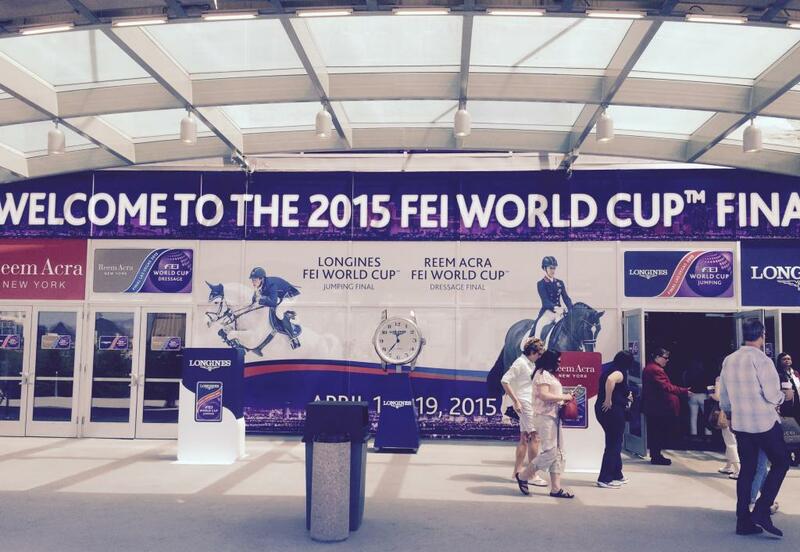 Las Vegas is the only venue that hosts both dressage and jumping at one combined World Cup event. Six long years had passed since this incredible event had been held at the Thomas & Mack Center in Vegas, and needless to say I was excited to once again see the best in the world compete. 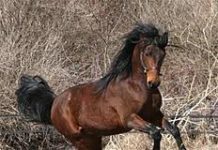 Although I’m now a dedicated endurance rider, back in the day I participated in lower level eventing and I really appreciate the training and dedication these magnificent horses & riders display. 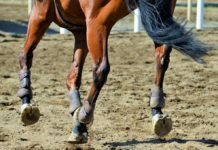 We endurance riders have it fairly easy when it comes to barefoot and booted information, but I’ve found that riders in other disciplines don’t receive the same exposure to new information as we do. I hoped that wearing my Team Easyboot and Tevis 2014 Easycare shirts might inspire some interest. Several show attendees did ask me questions and I gave them basic info and guided them to the Easycare website as a good resource. It’s always fun to talk boots with people. My friend, Sally Schiller (OTTB owner, hunter rider & instructor from Washington state) and I had tickets to all five days of performances. Talk about being immersed in horsey poetry-in-motion and athleticism! We both enjoyed the relaxed warmup day which gave the horses their first glimpse of the Thomas & Mack arena. 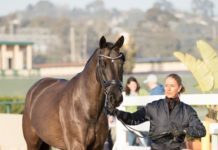 Most of the horses wore leg wraps and the riders were in casual dress as they entered the arena in groups of two to school dressage movements. The jumper riders got to school their choice of a variety of jumps later in the day. It was exciting to watch Steffen Peters and Legolas 92 warm up since Shannon & Steffen Peters are incorporating barefoot methodology and EasyCare products at their stables and in their training. I first learned about the Peters use of EasyCare products through a blog Garrett Ford wrote for the April 2014 EasyCare newsletter: Why Do We Do This? For Successes Like Squishy’s!. Another interesting article appeared in Dressage Today. 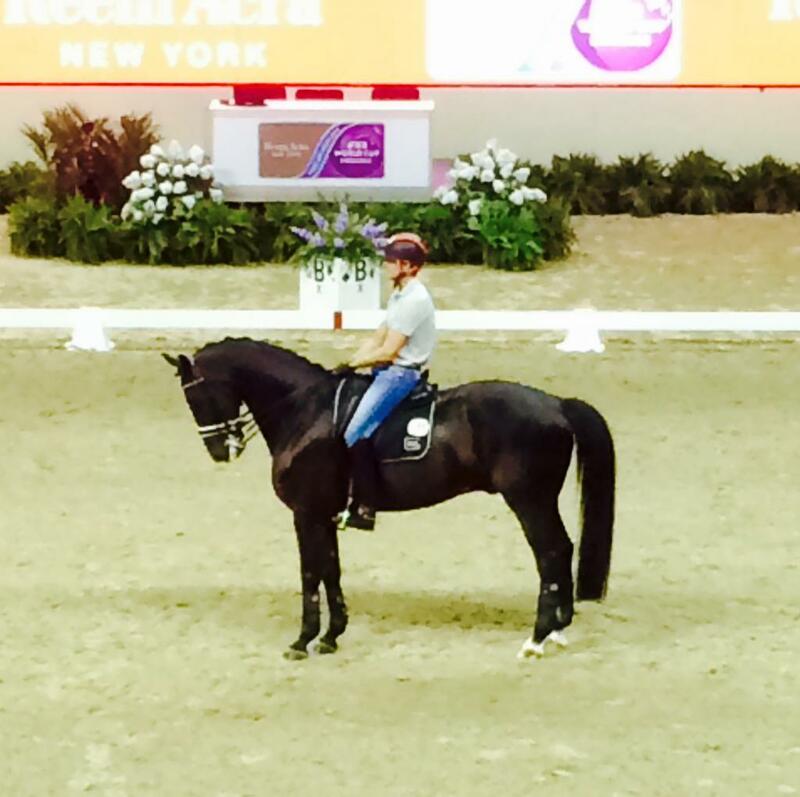 It was magical to watch the world class grand prix dressage horses dance around the arena during the actual tests. They displayed such precision and grace especially during the musical freestyle. They all inspired me to spend at least a little more time in my own arena with my Arab mares. The show jumps were enormous and the courses full of tight turns and multiple efforts. It was truly amazing. Being “friends” with Weltino’s Magic on Facebook, I was eager to watch Shannon Peters (Poison Ivy) riding Magic perform a Batman themed Pas de deux with David Blake on Ikaras. It was super to see these awesome horses and riders have so much fun. As at all good events, the trade show was amazing with lots of vendors showing the latest and greatest in new and shiny tack, clothing, stable wares and jewelry. Hmmm … no EasyCare products anywhere. See what I mean: other disciplines aren’t as lucky as us e-riders! Nevertheless, Sally and I did our best to pick out a variety of good and practical items. We both went home with new helmets, breeches and cooling leg wraps. I also got a pair of new-fangled baby blue polymer safety stirrups for jumping (you may see them out on the trail, too). 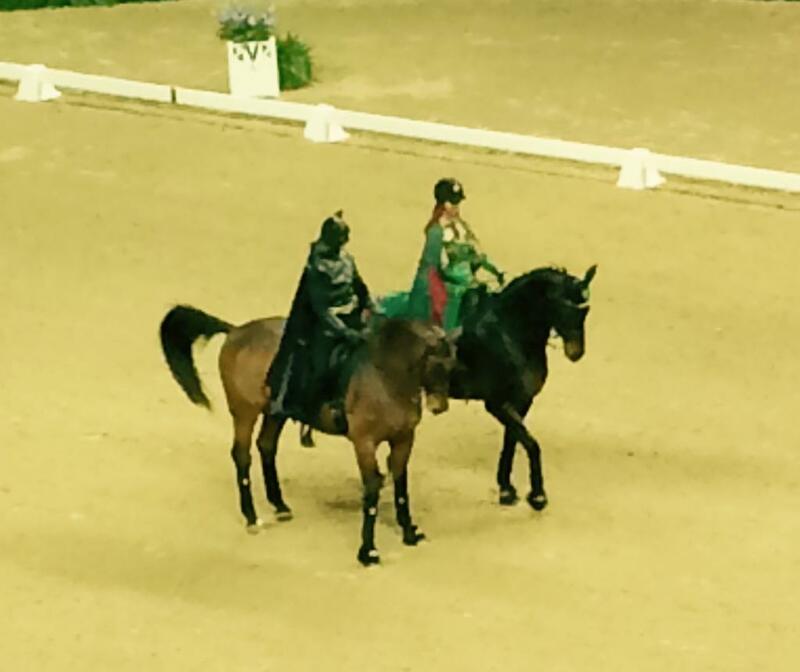 The dressage and show jumping crowd has certainly embraced glitter and bling on their helmets, boots and tack. 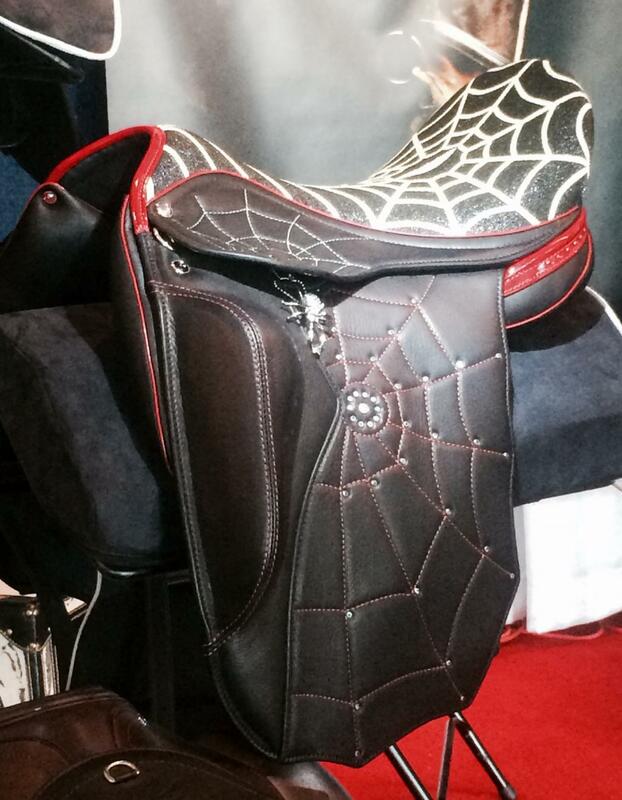 I’d love to ride this saddle down the trail but it may be just a bit over the top. 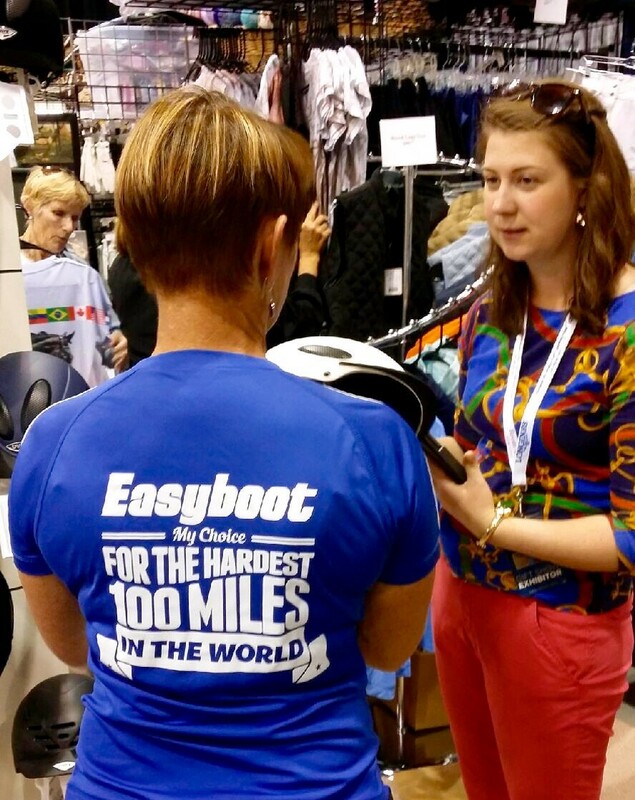 It was sure fun talking with the vendors and their customers about endurance and the booting options available from EasyCare. Most of them live and ride in a very different world than me but we found common ground in our love of incredible athletic horses. I’m already looking forward to 2017 when the World Cup Finals return to the US in Omaha, Nebraska.